On December 20th 1969 the Zodiac Killer mailed the 'Melvin Belli' letter containing a third piece of Paul Stine's shirt, the murdered taxicab driver in Presidio Heights on October 11th 1969. The 'Dripping Pen' card and 'Bus Bomb' letter were postmarked within a day of each other, so this was effectively the third mailing in a row harboring a sinister 'trophy'. The 'Melvin Belli' letter, whether a ruse or not, painted the picture of a Zodiac Killer going off the rails. In the correspondence he stated "I cannot reach out for help because this thing inside me wont let me. I am finding it extremely difficult to hold it in check. I am afraid I will loose all control again and take my nineth and posibly tenth victom. Please help me I am drownding," Later he continues "But if I hold back too long from no nine, I will loose all controol of my self and set the bomb up. Please help me I can not remain in control for much longer." This letter had very similar overtones to the murders attributed to William Heirens, known as the Lipstick Killer, who was convicted of three murders over a seven month period. Josephine Ross had been stabbed numerous times in her apartment at 4108 North Kenmore Avenue on June 5th 1945. Frances Brown was discovered on December 10th 1945 at her 3941 North Pine Grove apartment, again in Edgewater, Chicago. She had multiple knife wounds. In fact a knife was found present in the victim's neck, along with a bullet wound to her head. But on this occasion the killer had left a calling card, in the form of a message written in lipstick on the wall. It read: "For heavens Sake catch me Before I kill more I cannot control myself." On January 7th 1946 six year old Suzanne Degnan disappeared from her 5943 North Kenmore residence. A ladder was discovered outside the girl's window, and a ransom note was also found by police. The misspelled note read: "GeI $20,000 Reddy & wAITe foR WoRd, do NoT NoTify FBI oR Police. Bills IN 5's & 10's." Later an anonymous phone call was received instructing police to check the sewers and subsequent searches found dismembered body parts of Suzanne Degnan at various locations. Considering the Zodiac Killer's apparent fragile state of mind in the 'Melvin Belli' letter and its allusions to the William Heirens murders, was there a possibility the Zodiac Killer's next murder would carry any of these traits, and be referenced in his following communication. That is, writing on the wall, the use of a knife in the murder, possible dismemberment and a San Francisco connection. On April 19th 1970 the mutilated body of Robert Salem was discovered in his 745 Stevenson Street, San Francisco apartment. In an article by Paul Avery entitled 'The Bloody 'Satan' Murder' it reported that they didn't believe it to be a Zodiac murder "The 40 year old designer of lamps had been repeatedly stabbed with a long-bladed knife. The killer had apparently tried to decapitate his victim and when that failed he cut off Salem's left ear, carrying it away with him when he fled. There was also this bizarre touch: scrawled on the wall in Salem's blood, were the words "Satan Saves." The killer then in larger letters wrote "Zodiac" and drew a strange symbol resembling a crucified man. The same symbol had been drawn on Salem's stomach." Remember we stated that based on the 'Melvin Belli' and William Heirens murders, the next crime may contain components of these, such as: ​writing on the wall, the use of a knife in the murder, possible dismemberment and a San Francisco connection. The murder of Robert Salem had them all, and the Zodiac signature in blood. One curious feature in the crime scene, is the killer, had he wrote "Zodiac" similar in size to "Satan Saves", there would have been no need to write Zodiac in such fashion, split into two parts, so he could fit it onto the wall. Unless it was intentional. In the article it stated "An autopsy yesterday morning showed Salem was slain sometime last Wednesday." This puts the murder on April 15th 1970, five days before the Zodiac Killer mailed the 'My Name is....' letter and '13 Symbol' cipher, postmarked April 20th 1970. In a previous article, an avenue was explored that may connect the '340 Symbol' Cipher and '13 Symbol' cipher using the Zodiac's name. It is well recognized that the Zodiac Killer was an egotist, with inflated self importance, who just may have given us his pseudonym at the foot of the '340' cipher. It is written slightly differently, but nevertheless it was believed that this may have been a clue. When the correct spelling of Zodiac was placed under it and a numerical value was obtained, by alphabetically counting the difference between the six columns, it generated 0, 0, 0, 8, 8, 8. The three circled 8's he carried forward to his following '13 Symbol' cipher. See this article to read more. This effectively splits Zodiac into two halves, shown by the pink line in the diagram on the right. 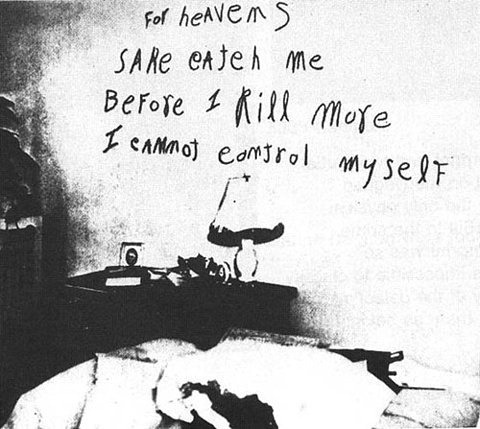 Exactly what the killer did on the wall of Robert Salem's 745 Stevenson Street apartment, situated a mile drive from Union Square, the location where it is believed Paul Stine picked up the Zodiac Killer shortly before his murder. The number 888 in Christian numerology represents Jesus or sometimes more specifically Christ the Redeemer. In view of the killer writing "Satan Saves" rather than "Jesus Saves" is there any connection. On the April 20th 1970 'My Name is...' letter, the Zodiac signed off with "PS I hope you have fun trying to figgure out who I killed. "​​​ Look at the way the killer wrote "Zodiac" on Robert Salem's wall. Is that designed to look like the 'figgure' 201. #1 Stanley Dean Baker confessed to the murder of Robert Salem, despite no evidence linking him to the crime, and he was never charged by police. ​http://murderpedia.org/male.B/b/baker-stanley-dean.htm. #2 The crucified image on the wall of Robert Salem's wall, is the Egyptian ankh. The ankh appears frequently in Egyptian tomb paintings and other art, often at the fingertips of a god or goddess in images that represent the deities of the afterlife conferring the gift of life on the dead person's mummy; this is thought to symbolize the act of conception. Wikipedia. Hi there, great site! As soon as I read "ankh" I thought of the My Name is Cipher, which untranslated appears to read as Aenk my nam. Was the photo with the ankh symbol published April 19? The article was published on April 21st 1970. To read the article you can click on it. Yes Drew, I looked at the cipher too regarding ankh. If the number 8 represented H, we would have our letter. But in all honesty the cipher can be interpreted thousands of ways, so proving any solution is not likely. Thanks for your time Richard. The Salem murder has always seemed like such a sloppy copycat crime to me. So elaborate and yet so unconvincing as a frame. How could the culprit screw up the simple zodiac logo and expect authorities to believe it? Reading this article is the first time I have considered that Z could be the killer. I use to believe that astrology was irrelevant to the case because it is not alluded to in the Riverside letters, and that he likely just read Kahn's Codebreakers and learned enough to make a cipher intentionally laden with errors. Your articles are making it increasingly difficult for me to ignore the 13 Moons calendar and all of the math connections. How certain are you that Zodiac had a post secondary education? While I'm asking questions that are impossible to answer, do you believe there is a 4PI Cult / Process Church connection to Zodiac or Baker for that matter? Trying to discover the level of intelligence of the Zodiac Killer based on his ciphers and letters would basically be guesswork on my part. His ciphers show a fair degree of organization, but his letter writing is strewn with spelling mistakes, and carry a childish quality. In recent years the Zodiac case has become a magnet for just about every conspiracy theorist on earth, that has actually propelled the Zodiac case into the realm of fantasy, far from the true reality of the case. Despite the fact that real people were murdered here, the case has descended into a bit of joke, to be honest. This man wasn't a mad genius with superhuman powers, he was likely an average person, doing an average job, with average intelligence. He got extremely lucky, particularly at Presidio Heights, where he should have been caught. But my guess he is the guy mowing the lawn on Friday, killing on Saturday and going to church on Sunday. Just like Dennis Rader. You know Drew, the person that looks so ordinary and harmless that nobody ever notices, but when caught suddenly everybody notices the evil in their eyes, the empty gaze and the dark foreboding look. Funny how nobody notices these features until after they are caught. To answer your question, I don't believe he was highly educated, but he was certainly no fool. Had Donald Fouke stopped and detained the suspect on October 11th 1969, Zodiac would have been nothing more than another 'depraved' killer rotting in jail, Robert Graysmith wouldn't have been a millionaire and I would be running a website on the Golden State Killer or basket weaving. Donald Fouke has a lot to answer for. It is very likely Zodiac used a book like Codebreakers, at least for inspiration. I think the fact the killer called himself Zodiac says it all, from the astrological standpoint.They seem to me to have relevance. All his murders fell on that first day of the 13 Moon calendar, as did so many over just a couple of years, but whether it happened by fluke or was designed, I certainly cannot say, and certainly don't get heavily protective of my theories. I am unsure of them myself Drew. But I will keep banging my head off the door. We may get there one day. We may crack a code or two, but unfortunately I believe it's too late to identify the killer. Sorry, as for the 4PI Cult / Process Church connection - No. Yeah not a lot of solid earth to stand on as far the 4PI story is concerned and every reason to doubt. I really appreciate your thoughts Richard. This case fascinates me like no other and its power to keep people obsessed for decades is certainly part of it. I am amazed at some of research that the Z community has unearthed over the years. I don't know what the hell to do with it but it's amazing to read! It has been quite an undertaking trying to process all of the important points of contention, which are of course all of them. After several months of gorging on your site and Morford's forum I think I feel the same about the Zodiac - he was certainly as lucky as he was clever - but I still can't stop staring at the 340 even though I have none of code skills you guys exhibit, and I flip back and forth all the time. I think your 13 Moons theory is terrific and agonizing and I mean that as a compliment! Thanks again for all your head banging! No! ZODIAC KILLER DID NOT THIS MURDER, Salem was gay and was connected with the Satan Church ZODIAC knew him but never get connected was the job some else ZODIAC said, next the numbers mean something you will be impressed because no talk about God the person who kill Salem use ZODIAC KILLER name to disguise the police and confuse but never knew ZODIAC KILLER next ZODIAC did not kill gay people and ZODIAC is not GAY! Was "Grand Chingon" the Zodiac?